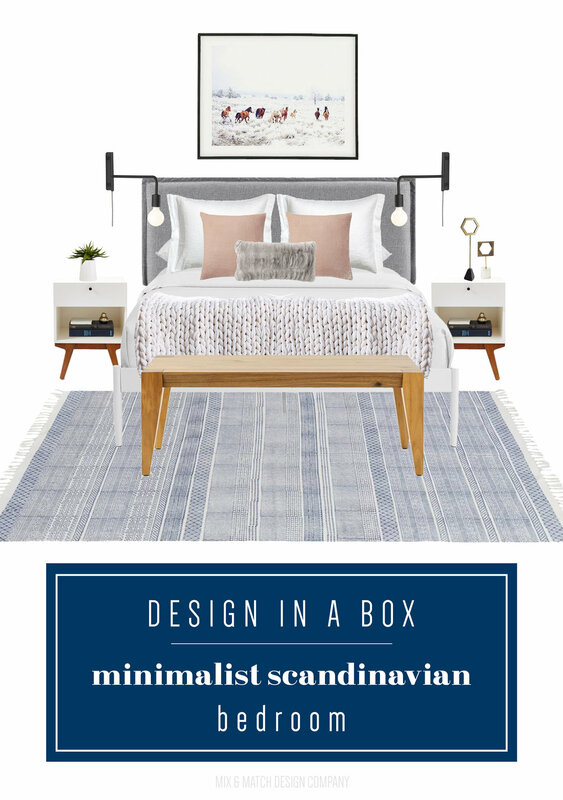 We're wrapping up the Design In A Box series with a Minimalist Scandinavian bedroom design today! 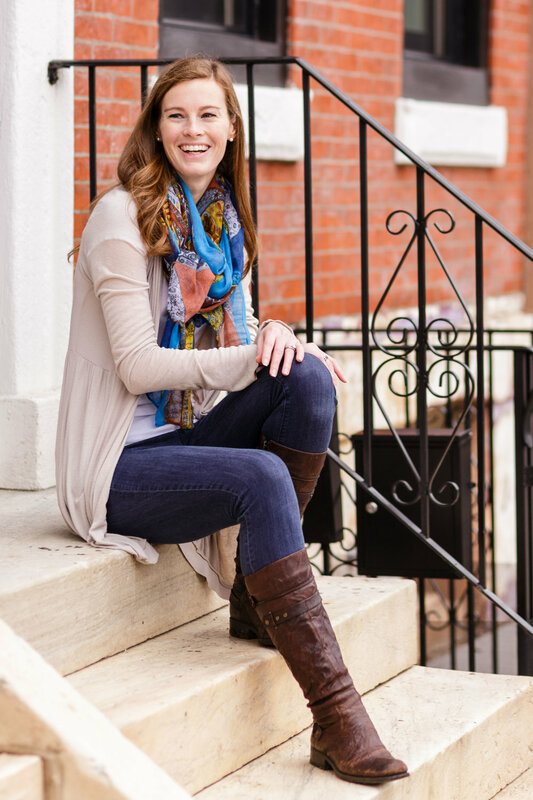 This is the fifth post in this mini series, which has been so fun to put together! I hope you've enjoyed it as much as I have. So what's taking the place of this series on Fridays? Gift guides! With Thanksgiving coming up next week to officially usher in the holiday season (although retailers would have you believe that the holidays actually started at the beginning of October! ), I'll be releasing a gift guide each week with a different theme in mind starting. To kick things off, on Black Friday, I'll be highlighting some small businesses in anticipation of Small Business Saturday. I can't wait! If you're new to Design In A Box, be sure to catch up on the other posts in the series! At the bottom of the post you can find all the sources for today's "Minimalist Scandinavian" bedroom design. I'd love to know what your favorite piece is - hop over to Instagram to weigh in! Now onto the inspiration behind this look! Maybe my inspiration came from the cool winter weather setting in, but this week I found myself wanting to design a simple and cozy bedroom, and no style conveys that look better than Scandinavian! The muted colors and mix of textures just feel like a big bear hug, don't you think? The style is truly the embodiment of "hygge" - the oh-so-popular Danish concept that is perfect for the winter when all folks want to do is go into hibernation mode. It can be hard to see all of the textures in a conceptual design board, but they're definitely in there! I incorporated linen, velvet, faux fur, cotton, natural wood, and different metal finishes that come together beautifully to create a relaxed, yet visually interesting vibe. I brought in a few pops of color with blush and powder blue, which have a calming, rather than energizing effect. On a side note, I find it pretty amazing how you can use color in different ways to evoke different emotions. Don't you just want to hop right in and take a long afternoon nap in that bed? Finally, I wanted to point out the galloping horses art print above the bed. The colors and tone in the print coordinate well with the natural wood pieces and bed linens to pull the look together. I love that it looks like the horses are frozen in time, and yet you can almost feel the vibration of their thundering hooves hitting that snowy ground just after the photographer's shutter clicked. I have a special place in my heart for those big, elegant animals. I grew up riding and competing until I went to college, and I miss being around them! If anyone recreates this bedroom in their own home, I would SO love to see it! Send me a photo or tag me on Instagram! Ready to shop this space? Use the links below to take a look at these pieces for your own home. If you're still in the research/planning phase, feel free to Pin it for later! The total cost to recreate this space? Only about $2,400! That's one very affordable bedroom design! All you would need to add is a dresser! Need more hands on help with designing your home? I'm ready to help! Check out my e-design services over here! *Affiliate links were used in this post, which means Mix & Match earns a small commission from your purchase at no cost to you. Welcome to this week's installment of Design In A Box! This is design number four out of five in this series - crazy to think there's one week left. After that, we're onto the holiday season - I've got some gift guides in the works for y'all, which I'm excited to share in the coming weeks! At the bottom of the post you can find all the sources for today's "Laid Back California Cool" living room design. After you look through it, I'd love to know what your favorite piece is - hop over to Instagram to weigh in! Over the past year or so, I've found myself being drawn more and more toward a casual, eclectic look, which is a style you see in a lot of homes in southern California. Amber Interiors (the brilliant designer behind the first inspiration image) has this cozy look down to a science - who else out there is a big fan of hers? It's one part coastal, one part mid-century modern, and one part vintage/boho. It feels relaxed, yet pulled together, and that's exactly what I wanted to do with today's design. 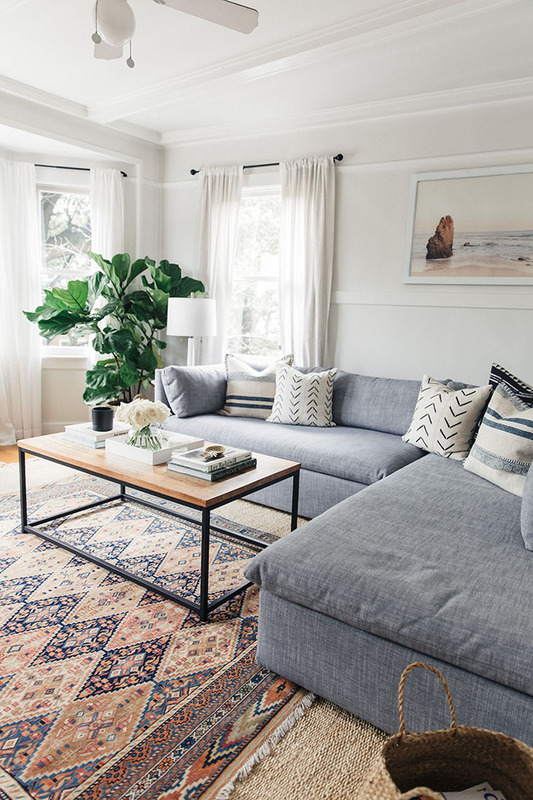 To create this living room, I started by finding a cozy gray blue sofa. And not just any cozy sofa - it had to be one with a bench cushion (rather than two or three cushions on the seat), which was something I noticed all the inspiration images had in common. It's a tailored, yet still casual style - perfect for this design. The other "must have" for this space was layered rugs. 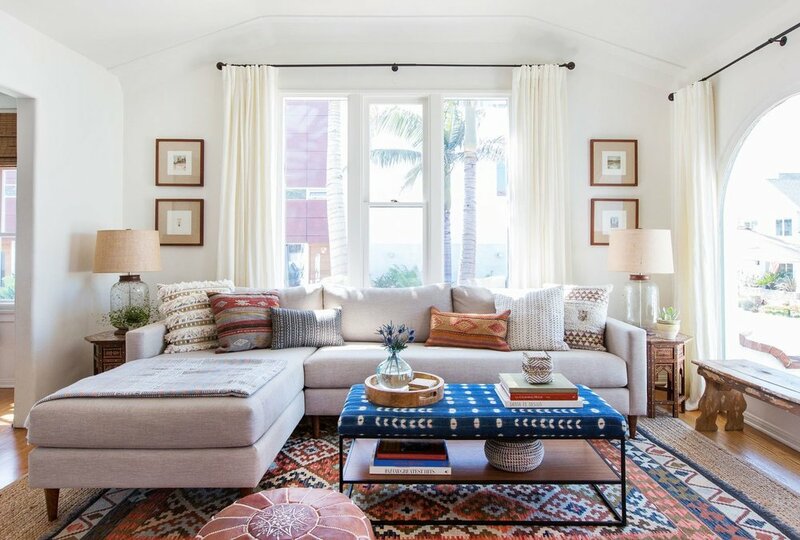 A neutral, inexpensive natural fiber rug is a great base for a Persian-style tribal rug. The jute/sisal blend brings in some nice texture, while the tribal rug adds color and pattern. I think they complement each other beautifully! I chose a readily available Persian-style rug for this design, but if you really want to get that authentic "California cool" look, go for a vintage one. It's worth the search! One note when you are layering rugs is to make sure you choose the right sizes. For example, layering a 5'x8' rug over an 8'x10' rug is a good combo because that will leave a nice size border around the edges of the smaller rug. To keep the eclectic theme going, I put together a quirky gallery wall behind the sofa. It has a lot of personality, doesn't it? I like the mix of photography, abstract watercolor art, the woven wall hanging, and - maybe the best part of all - the pennant that says "eat more tacos." I couldn't resist that pennant because we eat tacos three or four nights a week in our house. Can one ever have too much Mexican food? I think not. Anyone else out there a frequent taco eater? And finally, one other item I wanted to highlight are those woven suede accent chairs. They add so much texture, and somehow (magically?) feel both modern and boho at the same time. They would be perfect for a smaller space because they have a low profile, but still look quite comfortable. If you're contemplating them for your own home, do note that the seat height is lower than average, so take that into consideration before buying! Ready to shop this space? Use the links below to take a look at these pieces for your own home. If you're not ready to purchase right now, but would like to save the look for later, feel free to Pin it! The total cost to recreate this space? ~$4,300. If you're starting from scratch on a room, that's a reasonable budget for sure! And finally, I'd LOVE to hear from you! Don't forget to chime in on what style or space you'd like to see for the final Design In A Box post next week! Welcome to this week's installment of Design In A Box! This is the third post in this series, which will run until November 16th - then it's time to shift to all-things-holidays. I've got some gift guides in the works for y'all, which I'm hoping will be a great resource for you as the shopping season begins. If you missed the first week's Modern Eclectic Living Room or the second week's Preppy Modern Bedroom, be sure to check those out! At the bottom of the post you can find all the sources for today's "Floral Chic" dining room design. After you look through it, I'd love to know what your favorite piece is - hop over to Instagram to weigh in! Talk about starting off with a bang! I'll bet the first thing you noticed on this week's Design In A Box is that amazing blue and green floral wallpaper*, wasn't it? The colors and pattern of that paper were my jumping off point for putting together the look for this "Floral Chic" dining room. And guess what? It's removable! It's from an Etsy Shop called Sweet Pea Wall Designs - they carry an incredible array of beautiful removable wallpapers, and the one I chose for today jumped out at me right away. Be sure to check them out! I love supporting small businesses when I can, and shopping on Etsy is a great way to do that. 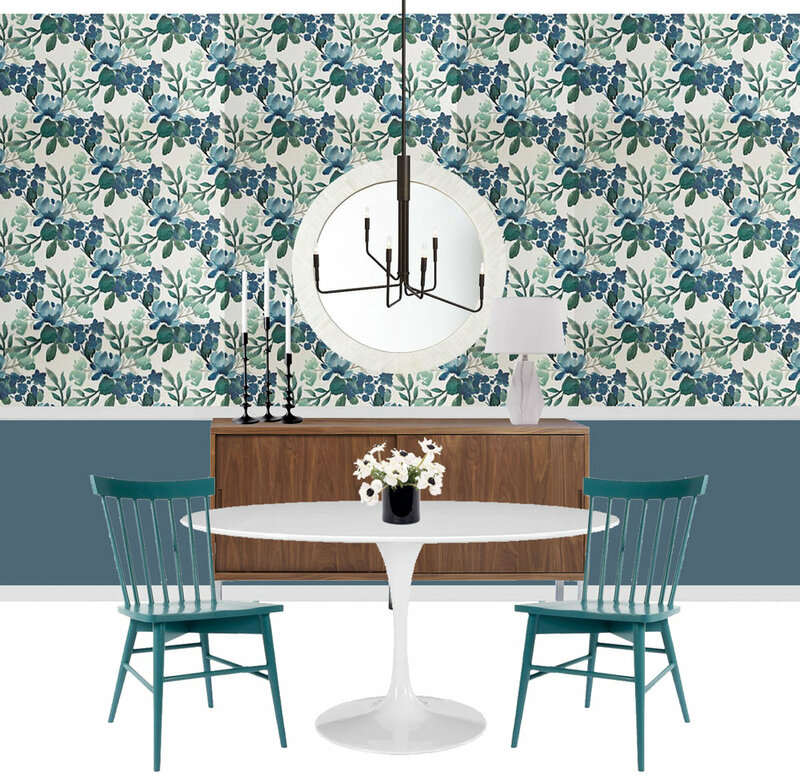 To keep the wallpaper from overwhelming the room, I chose to use it on the upper two-thirds of the space, then add a chair rail and paint the bottom third in a coordinating blue. If you're going to do this in your own space, my paint color suggestions would be Philipsburg Blue or Van Deusen Blue (both from Benjamin Moore), but I would suggest buying the wallpaper first, and then sampling a few colors to see what works best with it. The white oval tulip table is a classic mid-century piece, and it's great for small spaces since you don't have any table legs to contend with. This particular table is 60" long and can hold up to six. The light and airy Windsor chairs pair well with the table and keep it from leaning too mid-mod. Finally, I can't let you go without talking about that large bone inlay mirror - the details don't show up super well in the rendering, but man it's pretty in real life, and it's a great price for its size (plus, it's on sale right now!). Ready to shop this space? Use the links below to take a look at these pieces for your own space. If you're not ready to purchase right now, but would like to save the look for later, feel free to Pin it! The total cost to recreate this space with seating for six is around $2,500 (plus the cost of the wallpaper, which will vary depending on how many panels you need!). And finally, I'd LOVE to hear from you! What do you think of this series? Do you have an idea for a space or style you'd like to see on Design In A Box? I'm all ears! Need more hands on help with designing your home? I'm ready to help! My e-design services may be just the right fit - check 'em out over here!